Beauty Blog: New Makeup Line From Sigma! New Makeup Line From Sigma! These palettes are now available: here! The new makeup line consists of three different eye shadow palettes each with its own name: Flare, Dare, and Bare. Each palette will contain 8 eye shadows and a dual ended eye makeup brush. 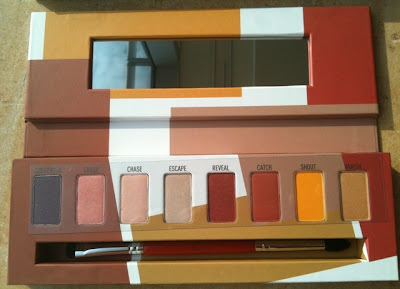 Each palette also has a mirror inside which is perfect for on the go! The palette will retail for $35 (USD) which is a fantastic deal because the retail value of the dual ended brush alone is $18. * Here is a picture of the dual ended makeup brushes that will come in the various palettes. I love how the handles of these dual ended brushes are colored to match the colored design of the packaging of their respective palettes, which you will see further below. 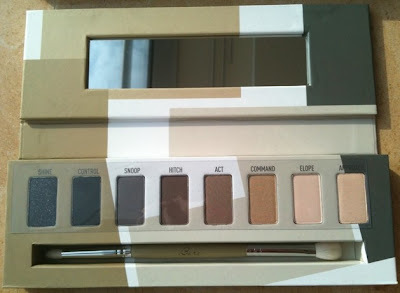 *Flare: This palette contains what I would call neutral with pops of color. The colors in this palette would be great for creating a neutral look but also great for those days when you want to add a little color. The colors from left to right are: Crush, Oversee, Define, Publicize, Resist, Gossip, Allure, and Beware. Oversee looks like the most gorgeous blue, perfect for adding a pop of color in the form of liner to a neutral look! This palette comes with an olive green handled dual ended brush that contains the E55 on one side and the E40 on the other. *Dare: The first though I had when looking at this palette is that it is fairly reminiscent of the colors you would find in the desert. There are a beautiful range of earthy shades in this palette. The colors from left to right are: Surrender, Grasp, Chase, Escape, Reveal, Catch, Shout, and Vanish. Shout looks like the most beautiful orange yellow shadow. That color reminds me of a gorgeous sunset. This palette comes with a red handled dual ended brush that contains the E20 on one side and the E45 on the other side. *Bare: This is what I would call the working professional's palette. It has a beautiful range of neutral colors for any working professional during the day, but it also has a few colors that could turn a beautiful neutral eye into an amazing smokey eye for the evening. The colors from left to right are: Shine, Control, Snoop, Hitch, Act, command, Elope, and Approach. This palette comes with what looks like a tan dual ended brush that contains the E30 on one side and the E25 on the other. I know a lot of you will be asking this question as well, what is the finish of these shadows? Per Simone on Twitter these will be a mix of matte and satin in each palette. I literally jumped for joy when I read that! I personally like using a mix of stain and matte shadows in my everyday look and I get so frustrated when I pick up a palette that has only one type of finish. Variety is the spice of life after all? Maybe not, but in this case that old sentiment rings true. These palettes are perfect for traveling because you have a great variety of colors with different finishes, 2 brushes, and a mirror all housed in a very classy and sleek looking palette! You better believe there will be a review on my Youtube channel as soon as I can get my hands on these! I really think that there is something for everyone here! Which one do you think you will get?